I think most people are hesitant to eat vegetarian meals because they assume they will still be hungry afterwards. Like Ryan likes to claim… “where’s the rest?”. In all fairness, I’ve ordered vegetarian entrees in restaurants and felt starving. Most restaurants seem to think that putting together the three vegetable side dishes of the day constitutes a meal. But there plenty of vegetarians survive just fine of their meatless diets. So what’s the secret? The secret is eating vegetables and legumes that are packed full of fiber and protein. Combine that with a healthy, starchy grain and you are in business. I was really excited to make this curry because I’ve never made homemade curry before. Curry dishes are found in Indian and Thai cuisines and are spicy, creamy, and envelope your taste buds with warm flavors. Spices like curry, cumin, coriander, and fresh jalapeno heat your palate and warm your senses. In a restaurant, curry dishes aren’t the best order for your waistline because of the creamy coconut milk. Coconut is high in vitamin C and helps lower blood pressure, but coconut milk is very high in fat. I use light coconut milk in this recipe to take away a lot of fat calories without substituting texture or taste in the curry. In a large soup pot, heat 1 tbs vegetable oil on medium heat. Add the white onion, shallot, garlic, and red onion. Saute for 2-3 minutes or until the onions begin to brown. Add the tomato paste and cook another 2 minutes. Add all of the vegetables except for the fresh cilantro (baby corn – peas) to the pot. Add the spices (curry powder – fresh ginger) to the pot as well. Saute for about 5 minutes on medium heat, or until the spices have enclosed all the vegetables and everything has started to brown. Add the vegetable stock and coconut milk to the pan. Bring the liquids to a boil and simmer on high for about 3 minutes, or until 1/4 of the liquid has evaporated. Stir so that the vegetables do not stick to the bottom of the pot. Reduce the heat and cook another minute or two. Stir well and season with salt and pepper as desired. If you want the sauce to be a little thicker (as pictured) cook another 5 minutes. Otherwise, divide the rice or cous cous among the four bowls. Add the vegetables and serve the curry sauce on top. Garnish with lime and cilantro if desired. * Note: if you do not have the remaining ingredients available for the curry, you can buy red curry paste in most grocery stores. Substitute 4 tbs red curry paste for the ingredients tomato paste – fresh ginger. 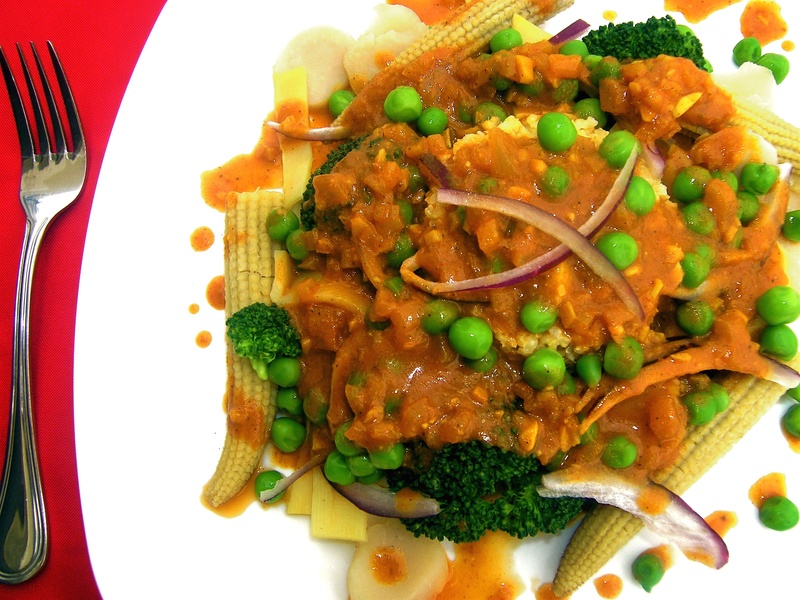 Add the curry paste to the fresh vegetables and cook the same way in the recipe.